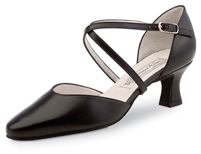 Sophisticated and extremely comfortable Werner Kern dancing shoe. Filigree interruptions with underlying fine mesh material give the shoe its light appearance. The enticing heel straps guarantee a comfortable and stable fit and are individually adjustable. Elegant and soft glove-quality Werner Kern men's dancing shoe with comfortable 5-hole lacing and two decorative seams. Small, hardly visible elastic bands are located at the inside as well as the outside, so that this model optimally and comfortable adapts at the instep height. The shoe is lined with soft glove-quality calfskin. Classic soft glove-quality Werner Kern men's dance shoe with comfortable 3-hole lacing. The hand perforated side part ensures an exceptionally good and comfortable fit. The slightly elevated and bevelled heel gives you additional foothold. The shoe is lined with soft glove-quality calfskin. Wonderfully soft, flexible and light Werner Kern dancing shoe made of durable lamb nappa leather with a divided sole. The shoe is lined with soft glove-quality calfskin. Soft glove-quality and extremely durable deer leather that provides a particularly gentle and supple fit. Exceptional wear and dance experience through high-quality breathable and moisture-absorbent calfskin lining and a pampering perforated ankle support. Infinitely comfortable Werner Kern classic men's dancing shoe with adjustable 4-hole lacing. The model is particularly suitable for broad feet. The shoe is lined with soft glove-quality calfskin. Ultra-light, classic Werner Kern men's dancing shoe with perforated wing cap. Adjustable 5-hole lacing ensures secure and comfortable fit. The shoe is lined with soft glove-quality calfskin. Soft glove-quality and very durable deer leather that provides a particularly gentle and supple fit.